At the forefront of teaching trial advocacy, Temple University Beasley School of Law has consistently been ranked by U.S. News & World Report in the top two in trial advocacy. The LL.M. in Trial Advocacy curriculum integrates the development of theory and theme, persuasive storytelling, extemporaneous speech, and effective use of technology in the courtroom. The program is performance based, featuring a “learn by doing” approach. Designed for the practicing attorney, the program is a one-year, 24-credit degree program, scheduled primarily in the evenings and on weekends. Our distance-learning component allows students from across the country to attend evening lectures and demonstrations via live, online broadcasts. All students attend two power performance weekends a semester in Philadelphia. Students graduate with a LL.M. degree in Trial Advocacy, and earn 24 substantive CLE credits and two ethics credits. In addition, this program provides a segue for our students to teach in academia. The LL.M. 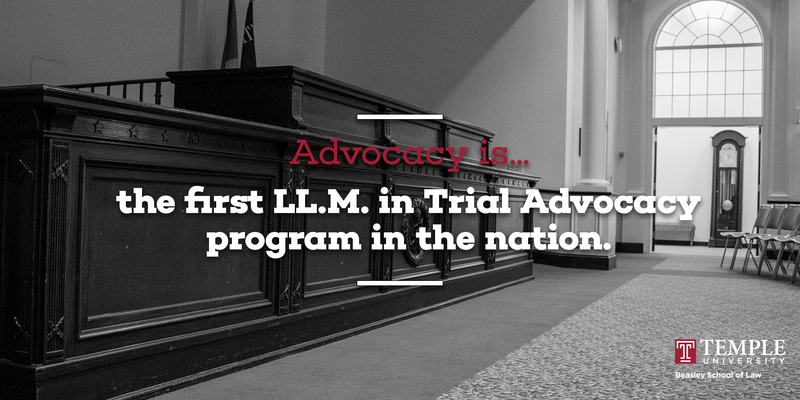 in Trial Advocacy is the only program of its kind in the country. It is an ideal fit for those who aspire to perfect both litigation tactics and courtroom performance. Prospective applicants are encouraged to speak with alumni who have completed the program. Interested students can learn more about the LL.M. in Trial Advocacy online.